Top » Catalog » Modifications » Do It Yourself » STNGWingLED Bookmark Us! 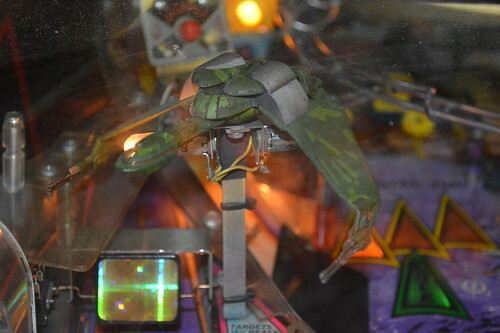 Tired of looking at those pesky bulbs under your Williams' Star Trek: The Next Generation Pinball Machine's Klingon Bird of Prey (KBOP)? Looking to upgrade your stock KBOP to the more detailed 1994 Hallmark Star Trek Klingon Bird of Prey without paying as much as $160? ...then look no further. This Do-It-Yourself kit provides all the circuitry to remove those pesky bulbs hanging under your ship and enable you to use the Hallmark's KBOP pre-installed lighting with power delivered from the STNG's 6.3VAC GI. 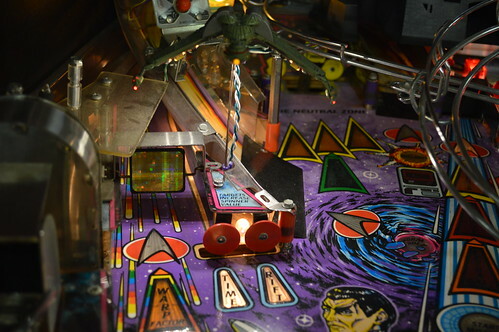 This pair of Printed-circuit Board Assemblies (PBA) come assembled with a non-polarized set of high brightness LEDs to illuminate your Playfield in a nice glow. Each Kit comes with a pair of boards of which each board has 3 LEDs which are controlled by a constant current mirror to ensure each LED is the same brightness. 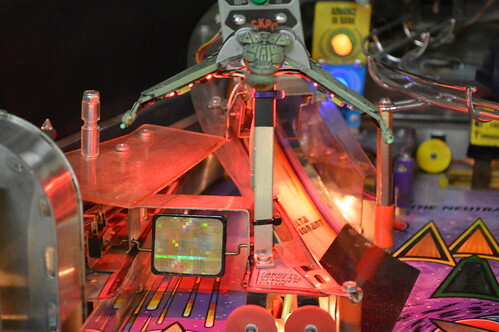 The current mirror also helps to resist flickering due to all those coils firing during gameplay. This New revision provides a Brightness variable resistor (knob) on each PCB to allow you adjust the LEDs brightness. Also new to this batch is the ability to select Purple or Warm White LED colors in addition to the standard red. When you can have this!! As of 12/2/2017: The Purple WingLEDs are out of stock and we do not plan on re-stocking do to lack of interest. Warm White (below) is also on a last-time buy given it's lack of interest. 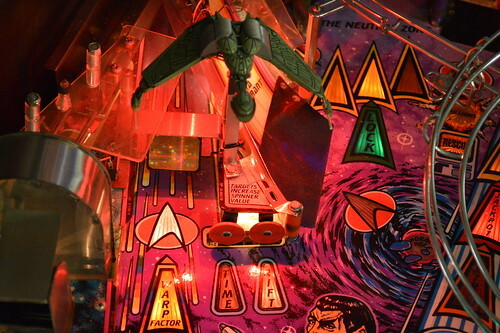 Please note that these WingLEDs and the Hallmark ship are intended to be installed in a stock 6.3VAC GI on the STNG pinball machine. This product is not compatible with the 9VDC outputs of the OCD product. Please see this thread for possible solutions. and should only take you about an hour to install. For more information on these kits or for general help; please visit the Pinside Thread or our Blog. Notify me when "KBOP WingLEDs" is re-stocked.